It was one of the most scathing assessments of a children’s social care department government officials had ever seen. After visiting Cornwall in 2009, Ofsted branded the authority’s children’s services ‘inadequate’ and its senior leadership ‘ineffective’. Inspectors warned children in the county were not being properly protected and frontline teams were struggling with “excessively high” caseloads and staff shortages. While the report’s tone was sober its overall message was clear: this was a department in crisis. Marion Russell, now Cornwall’s principal social worker for children and families, remembers how it felt when she joined Cornwall as an agency social worker in 2008. “What really struck me, as someone coming from the outside, was the disconnect between the frontline and management. Social workers didn’t see managers. There was no sense of common purpose. Individual social workers were doing a good job, and I’ve always said that, but there wasn’t a systemic approach. These days the outlook for Cornwall’s children’s services is much brighter as Russell and her colleagues have been part of one of the most remarkable turnarounds of a children’s services department in recent years. Last year Cornwall became one of a minority of authorities to achieve a ‘good’ rating under the tougher Ofsted inspection regime introduced in 2013. This time inspectors praised the council’s “strong” leadership. Cornwall, they said, had created an environment for “social work to flourish”, with manageable caseloads and regular supervision. Trevor Doughty has overseen Cornwall’s resurgence. He was appointed as the council’s director of children’s services in 2010, moving from Northumberland, where he’d led services to an ‘outstanding’ rating. When he joined, Doughty found a system unfit to deliver the improvements needed. He also discovered a workforce whose confidence was “completely shot”, with morale at rock bottom after a period of sustained criticism and instability. “There was a long rebuilding job to do which required addressing the fundamentals. The service didn’t have a clear sense of direction and it hadn’t had consistent leadership for years,” he recalls. Doughty says the appointment of Jack Cordery as Cornwall’s head of service for children’s social care in January 2011 was key. He arrived from Wandsworth council, where he’d helped children’s services get an ‘outstanding’ grade. At national level, Cordery sat on The College of Social Work’s children’s faculty. He had also fed into both the Munro review of child protection and the Social Work Reform Board’s recommendations. These experiences, particularly Munro’s report, proved invaluable as Cordery drew up a blueprint for Cornwall’s recovery. He diagnosed three fundamental problems with Cornwall’s services. Firstly, he felt past management had prioritised performance targets over practice, and had a damaging tendency to blame frontline staff for problems. Secondly, cutbacks to training and development had hit social workers’ confidence and skills. Thirdly, practitioners felt “overwhelmed” by the volume of cases coming their way each day, not helped by some agencies making inappropriate referrals. “People were throwing things into children’s social care that just shouldn’t have been in children’s social care because it was a scapegoat in a sense, the whipping boy, for the whole of the system. There wasn’t the confidence to say ‘no, this doesn’t meet the threshold’,” he recalls. Missing, says Cordery, was a vision for Cornwall’s social care that everyone could rally behind. He spent months talking to staff coming up with a shared set of values to work to. They eventually agreed on a model with the strapline: “Reconnecting social work”. Underpinning it was a set of changes designed to give frontline staff the tools to do their jobs well. Six months after arriving, Cordery presented the council’s cabinet with a report setting out the start of a new career and qualifications pathway for social workers with each stage linked to the Professional Capabilities Framework. 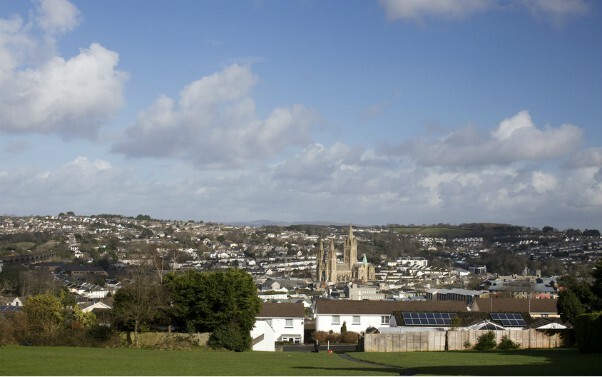 The plan would also see Cornwall become one of the first councils in the country to follow a key recommendation from the Munro review by appointing a principal child and family social worker (PCFSW) to lead on enhancing practice skills. Russell took on the role in 2012. With experience as a team manager, a practice educator and frontline social worker, she felt the PCFSW job offered an “absolutely perfect” opportunity. Russell and Cordery encouraged their social workers to read the Munro review, and began implementing as many of its recommendations as possible. One of their first moves was to revise the recording requirements placed on social workers to see if they could free up staff from spending so much time on computers. “We reduced the requirements by about 45%,” Russell recalls. “Munro recognised that compliance culture, where people are so terrified about getting everything down on a computer. Another priority was reviewing supervision, not just the frequency of it but the quality too. Russell developed supervision guidance based on a system she’d been piloting while a team manager. It set an expectation that social workers get fortnightly one-to-one or peer supervision, with a chance to reflect on cases. Supervision capacity was boosted by the introduction of principal social workers in each team. Russell says the changes helped staff feel “safer” and built a sense of shared responsibility for cases, which didn’t exist before. The changes were part of a wider effort to invest in the support and development of Cornwall’s social workers. When Ofsted inspected services last year inspectors praised the “comprehensive” CPD framework on offer. Social workers in Cornwall get more than just the ASYE programme. The council also funds its children’s social workers to spend the next two years doing modules that give them a postgraduate certificate in advanced childcare practice. Then in years three to five they can do another three modules and get a diploma, after which they can complete a masters degree. Russell says this support, alongside a ‘grow your own’ social worker scheme that sees the council train up new social workers locally, makes a huge difference in overcoming some of the challenges Cornwall faces in attracting and keeping social workers. “Cornwall is beautiful but because we’re on a peninsula we don’t have lots of neighbouring boroughs. The house prices are high here and social workers’ partners can find it hard to get jobs. We can’t change the geography and the other social factors. But we’ve worked on the areas we can control,” she says. Cordery knows that with local authority budgets tight, staff development can often be the first area earmarked for cutbacks. But he says he was determined to make sure Cornwall became “a learning organisation”. “It’s not cheap but it’s not as expensive as not doing it. We needed to make sure that our frontline practitioners had the skills and the support and the supervision to do the job that they were being asked to do,” he says. Frontline social workers say they’ve noticed a difference. Stacey Pellow-Firth joined Cornwall in 2002 and remembers how pressured things felt when the damning Ofsted report arrived in 2009. “You already had the pressure from the outside world’s perception of social workers, and then when you’re working for a council that’s in a constant state of being told you’re not good enough…it eats down at your confidence,” she recalls. Pellow-Firth stayed and says she and her colleagues were “thrilled” when last year’s ‘good’ rating arrived. She sees a “sea change” in the council’s social work compared to 2009 and says “solid leadership” has made a huge difference, as has the chances on offer for social workers to develop their careers. Pellow-Firth herself was appointed to a principal social worker role in a family therapy service, and has undertaken a postdoctorate research study alongside her practice. Doughty and Cordery recognise there are more improvements to make in Cornwall but say there’s a plan in place to get there. There is, says Doughty, no illusion that the job has been done – “if we take our foot off the pedal, things can decline very quickly”. Cordery knows how fragile a well-performing service can be. In the five years after he left Wandsworth the council plummeted from ‘outstanding’ to ‘inadequate’, something he says was “a shock and very saddening”. For him, one of the lessons from Cornwall’s experience is that properly adhering to the Munro review gives councils a “much greater chance of success”. “I feel very strongly that if Ofsted and the DfE had focused more on checking how local authorities were implementing Munro, I don’t think the sector would be in the place we are at the moment,” he says. Russell agrees and having been at Cornwall during one of the service’s toughest periods, she’s also pleased that the “unrelenting commitment” of staff over the past few years to deliver the changes is making a difference. “I would never like to put down the actual day-to-day job that social workers were doing in 2009. I will never take away from that because throughout everything, social workers have been doing that and working really hard,” she says. “The difference now is that they are doing it as a confident profession who have the knowledge and skills to make change and are supported by a system to help them do that. Manager tells me this is not the whole story! Good luck to Cornwall, let’s hope it works out! Marion and colleagues at Cornwall have done an amazing job, PSW at the heart of the improvement journey. Nothing more nothing less! Sounds very much similar to Gloucestershire where Family Support Workers have to spend x4 days a week in the office doing paperwork and unrelated work. Supervision is either non existent or completely rubbish and is used purely to criticise and blame. Managers who bully, harrass and intimidate as well as openly lie on a regular basis. Workers are made to feel de skilled with responsibilities taken away from them. Little or no consultation and workers treated like children by management. Good sound intensive support work is being replaced with Triple P a parenting programme that just doesn’t work with a lot of families, although it is good with the less troubled families. It is being used more extensively to secure payments from the Government under the Payment by Results scheme….however in my opinion this does not help the families with major problems which are the ones the Government want to help, to drive down the cost to the taxpayer in benefits etc. Individuals have to have the confidence and strength to resist pressure to take on new cases if they’re not managing their current caseloads for the reasons outlined above – bottom line is, it is ok to ask any line manger to put in writing what are priorities in the paid working hours availiable in that week – this is evidence that both defends the worker against unfair management practices and is evidence for those same managers to take to senior managers to justify why a service is at risk of failing unless there are more (human) resources. Whatever happened to polite requests with offers of ex-gratia payments for working over and above contacted hours on a regular basis (used to be called overtime!)? It is great Cornwall has done well. However, it does need to be emphasized that the workers on the ground were very important for this to happen and that there were also quite a few agency workers who worked very hard in achieving this. I worked for Cornwall at that time and returned to London afterwards; agency staff were on the whole ‘let go of’ after the event in Cornwall and staff ended up filling the gaps they plugged; hopefully this won’t make things more difficult for the permanent field workers. Agency staff also did a lot to make this happen and there were many good ones there. It isn’t just about one Senior Mgr. and PSW it is about the whole support and effort. Well done guys on the ground, including admin.